When the hemoglobin of red blood cells is broken down, one of the products is bilirubin. Bilirubin binds to albumin in the blood and is carried in the liver, where it is attached to glucuronic acid by the enzyme UDP-glucuronosyl transferase (UGT). Attaching the bilirubin to the glucuronic acid makes it soluble, and allows it to be excreted in the bile into the small intestine. Retained bilirubin results in jaundice. The UGTs are encoded by a complex gene on chromosome 2. The gene can form multiple UGTs by variable processing of the first exon. The form associated with bilirubin metabolism is UGT 1A1. Mutations in the gene can lead to either mild or severe jaundice. The amino acid sequence of UGT 1A1 is seen in the table below. In this piece, the amino acids have been divided into the more water soluble types, played throughout by solo oboe, and the less water soluble types, played by various other instruments. 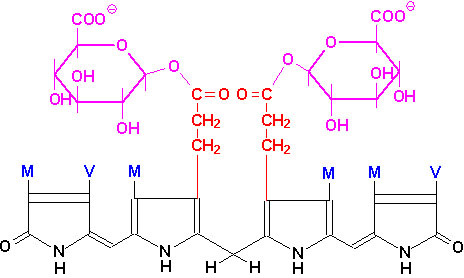 The first four notes of the piece are the water soluble amino acids of signal sequence, which is necessary for protein secretion, and which is later removed. The oboe is then joined by harp and harpsichord , which sound the less water soluble amino acids throughout the piece. The solo oboe is joined in several sections by small instrumental ensembles of strings and winds.